The Architact Collective are delighted to introduce our second collaboration with Sarra Tzijan. Sarra is a Melbourne based artist with a background in print, drawing and painting. More recently she has begun studies in jewellery design, developing new techniques and processes. 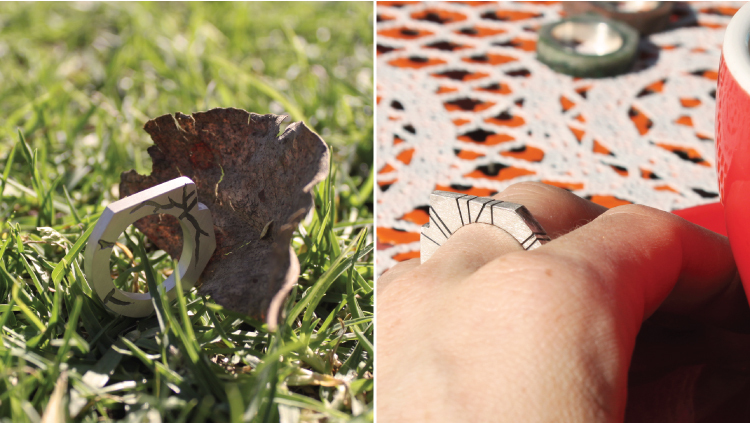 The hand-crafted rings by Sarra are the exploration of surface embellishment and texture, using our natural and built landscapes as a source of inspiration. The design reflects raw elements, natural surroundings and a connection to our immediate environment. Each ring is hand-crafted to ensure it maintains a personal, unique aesthetic. 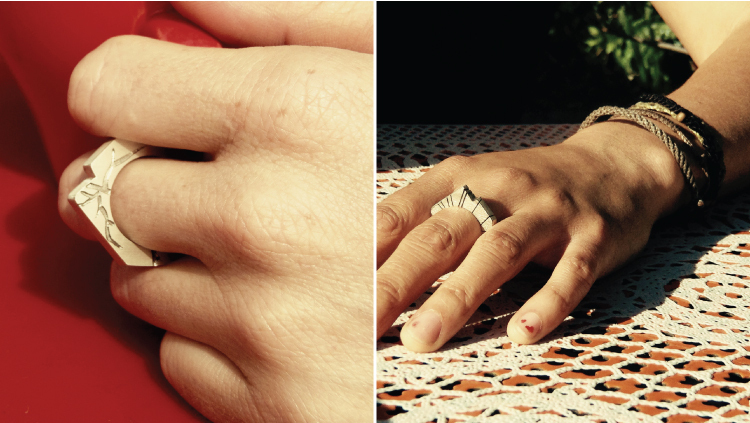 Together Linda and Sarra have created a series of 4 limited edition sterling silver mountain rings. 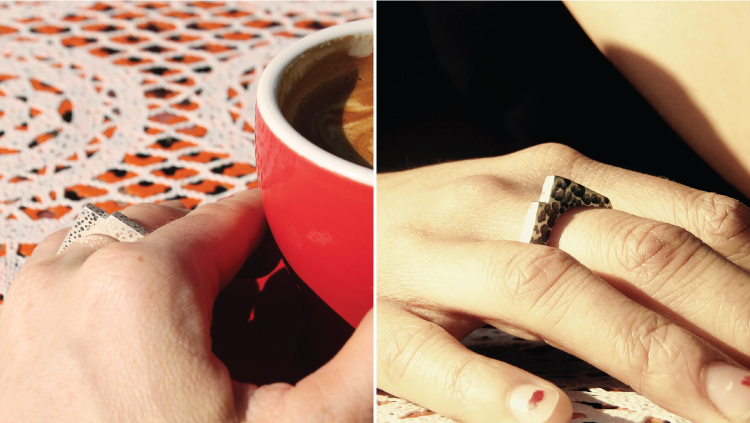 The rings are available via the Architact Collective website where you can choose your favourite design and ring size before Sarra creates your ring to order. 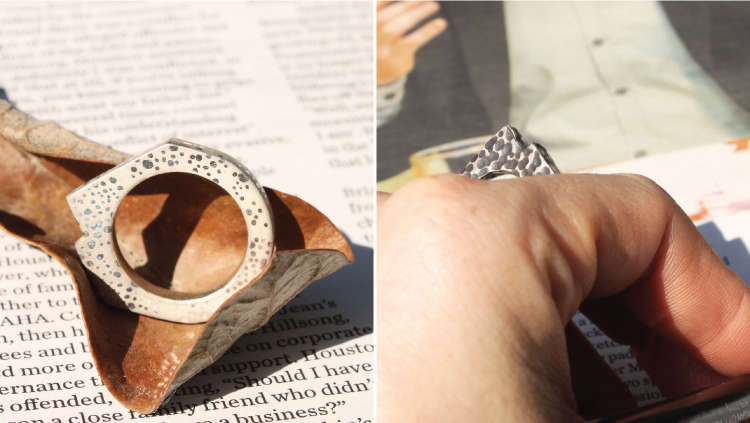 To create each ring a wax mould is made of the Original DIY Concrete Mountain Ring and then cast in sterling silver. The silver ring is repeatedly filed with various tools to create an even and flat surface. The ring is covered with a resist layer, the design is then cut out from this resist layer. The metal is then placed in an acid solution where the exposed areas will react and slowly begin to degrade the silver, leaving a unique etched surface pattern. The ring is then refined with emery paper until a soft matte finish is produced, creating a contrasting surface to the textured grooves. Sarra describes her work is an expression of her conscious connection to all living things, and the simplicity and beauty she finds in that relationship. Through her incredible drawings Sarra portray’s an honest and personal picture of her internal thoughts and emotions through other worldly characters and unique interpretations of life and form. Sarra’s aim is to create a world that searches for control within chaos. We are delighted to welcome such a talented artist into the Architact Collective for this incredible collaboration. Whether you are looking for a unique gift or a one-of-a-kind addition to your personal jewellery collection, this ring fits the bill perfectly. A true piece of art you can wear throughout the day and admire. Our Collaboration with Sarra is currently on display at the Brunswick Street Gallery. Join us on the opening night this Friday (31.10.2014)!